For the last few years I have struggled with my weight, I have never weighed this much, not even at the end of any of my 3 pregnancies. It has been embarrassing and depressing, so when I was told the women in my family were going to do a Biggest Loser type of Weight Loss Competition I knew it was just what I needed for motivation. 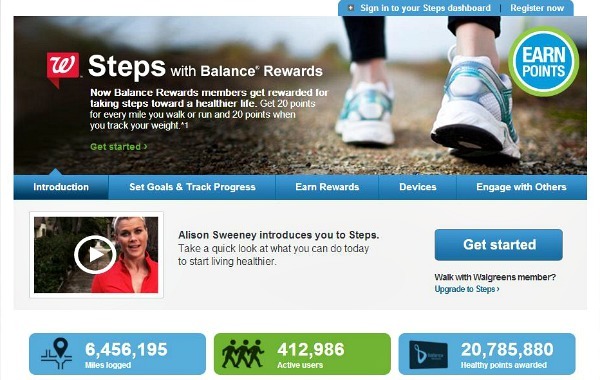 The competition goes perfect with Walgreens new Steps with Balance Rewards. I receive almost daily emails from Walgreens as a Balance Rewards member. I learned of the Steps with Balance Rewards from an email and decided to check it out. 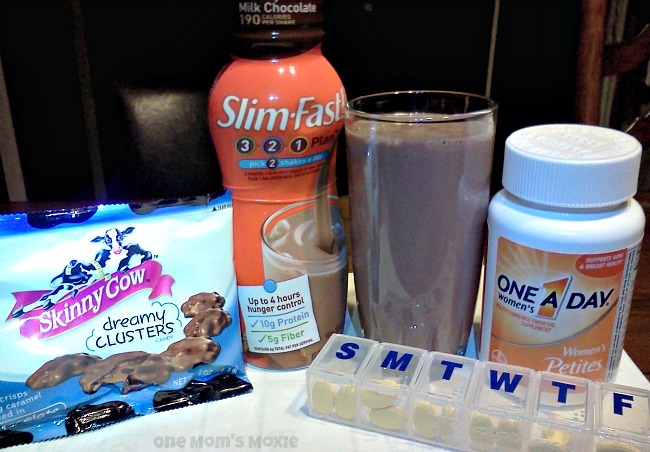 I became a member of the Steps with Balance Rewards and then I found out about the Step Up to Win Sweepstakes. There is an instant win everyday and then they teamed up with The Biggest Loser so the grand prize winner will get a stay at their choice of The Biggest Loser resort. After entering the Step Up to Win, I decided to look around the site. I checked out some of their health items and really like this pedometer heart rate monitor watch. I think I will reward myself with it after I lose a few pounds, maybe I'll use my reward points to buy it. After all of that I wanted to go shopping for some healthy items at Walgreens. You can see my entire shopping experience here. I wanted to find things that would help me lose weight. 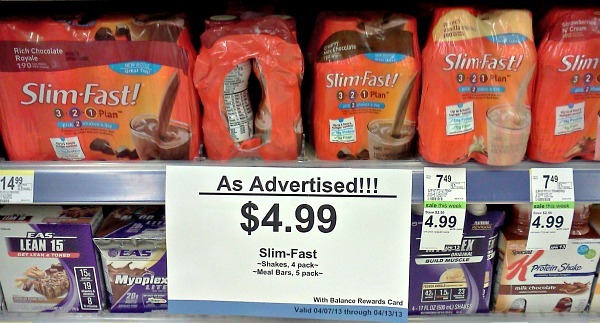 Just as I started looking in the weight management are I found a great deal on their SlimFast! Once I got home I was so excited to start my weight loss journey. Here you can see I also picked up some multivitamins, a pill reminder and a low-calorie treat. Now all I need to do is stick to my healthy regimen and begin to exercise. It's so cool that for every weigh in and step I take I will be rewarded points through the Steps with Balance Rewards. Oh and by the way I have already earned over 300 points just for signing up, doing a weigh in and counting all my walking for the day. I know I can do this, for me losing this weight is not just for myself but for my family, I want to be around for a long time. Also, it doesn't hurt that the family weight loss competition will have a cash prize for the lady that loses the most! So now that I have one more thing to motivate me. I am so ready! Make sure to keep up with me and my weight loss journey for the next few months and to see who wins in my family! To stay up to date with everything Walgreens related you can follow them on Facebook and Twitter. You can also check out some cool Aisle Share FUN, real stories by real people. Click HERE for my most recent GIVEAWAYS! There's a bigger issue to losing weight than actually losing weight. I find that when I'm in "weight loss" mode, I become obsessed. I log calories, exercise almost every day--My mind is either all or nothing. Losing weight is much more difficult than maintaining weight, and for that reason (oh the irony), maintaining weight after weight loss does become more difficult. The transition from weight loss to maintaining is kind of harsh. I lose weight, but never reach my ideal goal (because eating under is tiring and leaves one hungry). After my wife watched my transformation she finally got on board. Her results have been more dramatic than mine. 30lbs in 2 months. She now has to pull her pants up all the time. Her energy level has increased and she isn't hungry. She has to remember to eat. Now it's up to you to try it. I've done it for a year solid and it is indeed a wonderful change. I have made a pledge to myself to eat healthy. Today I ate turkey, salad without croutons, a minute amount of ranch dressing and two grapefruits. I also had one cup of sugar free chocolate pudding. I am trying to limit my sugar, so I eat fruit when I have a sweet tooth. I also drink lots of coffee, but I use truvia instead of regular sugar. Am I on the right path. Please respond. Hi Jennifer! Thanks for asking my opinion! Here's the thing about eating healthy, you have to make sure you eat enough food too. You have to make sure you eat enough calories to keep your body from thinking it's starving. Also I am not for anything "sugar-free or "fake" sugar" but I go with to each their own. If it is working for you and you feel good then that's good. However, I would highly recommend asking your physician or checking out this link: https://www.walgreens.com/steps/stepslanding.jsp there is a great community that can help you as well. You can set a goal and track your progress on the site. I am so proud that you are wanting to eat healthy and take good care of yourself, it's a wonderful thing to do for ourselves! Please feel free to reach out to me anytime, I can be found on almost any social media as One Mom's Moxie, here is my facebook page: http://www.Facebook.com/OneMomsMoxie or you can send an email: OneMomsMoxie@gmail.com Keep it up and you'll be eating healthy and feeling great in no time! A half grapefruit before a meal except breakfast, yogurt with frozen berries in am (not large amount), Ezekiel bread toasted and topped with almond butter for breakfast. You can make your almond butter if you have a food processor. use about 11/2 cups of almonds and add almond oil as it gets to the smooth stage. Mediums size lunch and small dinner early evening. I splurge and have 1 latte with no fat milk for breakfast. The rest of day only water. I have lost over 40 pounds with this and I am keeping it off. If you walk it helps to drop the pounds. I also eat yogurt and berries before bed. I use greek and add some vanilla extract and about a teaspoon of honey to a small portion of yogurt this way everything is all natural going into your body. Try to have a bowel movement after every meal. the longer the stool sits inside, it is my opinion the more calories will be digested. The bread is so amazing with the adding of bulk, and it is very good for you. Been this way for almost 3 years now. If I want to lose more weight all I have to do is exercise more.